Has Maruti Suzuki made the new-gen Ertiga a family car that's about more than just the essentials? The Maruti Suzuki Ertiga was never a car created to invite superlatives. It did absolutely nothing in a spectacular fashion, but still struggled to find any challenging rivals after being around for six years. Because it got the job done. The Ertiga did what Indians expected of it and so, it sold and how! You couldn't even get a discount on the outgoing car because the demand just wasn't fading. 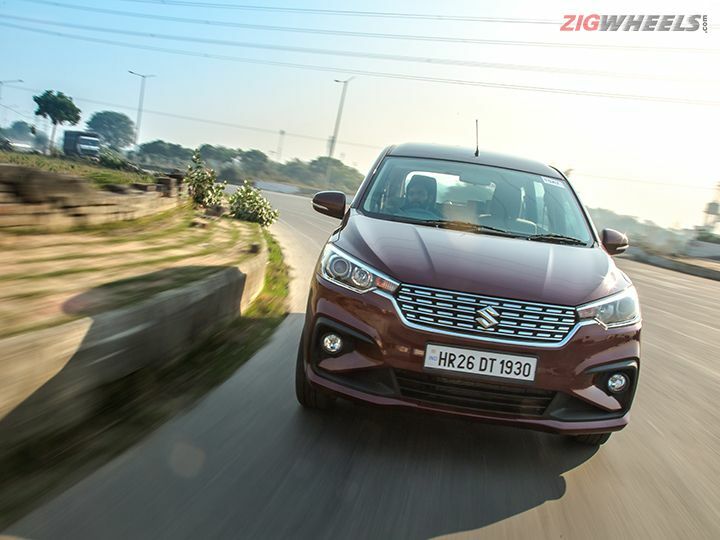 This time around, though, Maruti is seemingly trying to project the Ertiga as something that delivers more than just the necessities. Its appeal supposedly lies beyond just plain old sensibilities. Have they done that or is this more of the same? The Ertiga always offered some big car appeal despite a small footprint. That’s been retained, but now there’s more presence, courtesy two touches. Number one is the size. The wheelbase stays the same (2740mm) but it's 99mm longer, 40mm wider and 5mm taller. With the larger size and the higher-set bonnet, the MPV also attempts to offer some SUV charm. And that works well with the more aggressive design tweaks, like the chiseled bumpers and flexed bonnet lines. And number two is the flash factor. The chrome studded grille, LED tail lights and slightly overstyled 15-inch alloys, all make the new Ertiga look less docile. Oddly, though, while you do get projector headlights as standard, unlike the Ignis, Swift, Dzire, Ciaz or S-Cross, these are halogens and not LEDs. No DRLs either and we're curious to see how the aftermarket responds to this. And, don’t worry, it’s not just you. We see it too. The tail lights, while they blend well with the design, look brow raisingly similar to what you’d see behind a Volvo. But junk the descriptions. What Maruti’s done here is hit the sweet spot. It looks daring enough to be distinctive, but safe enough to not be a turn off for thousands of existing Ertiga owners who might want to get the new one. #1 Every row is reclinable and they all get adjustable headrests, save for the second row's middle passenger. And this is standard kit. #2 Sense of space: Beige interior aside, the glass area is massive. It's hard to tell if the second row door has a window or the Alto's windshield attached to it! Also, the middle door is more like a gate because of how big it is and how wide it opens. That, combined with the low floorpan makes this a breeze to use for the elderly. #3 The cabin space is usable for seven adults, even with 6-footers in each row. The middle occupant will face a little squeeze, but it's usable nonetheless. While the first two rows don't feel much different in terms of space, the 3rd row sees improvements in shoulder (15mm*), head (20mm*) and knee room (minimum knee room up by 60mm*). There's oodles of footroom here too. This makes the new Ertiga less of a 5+2 and more of a true 7 seater. Even the rear AC blower has vents that have been well placed to be usable for the last row. The vent console looks like it juts into the first row headroom, but even for yours truly's 6’5” frame, it wasn't a hindrance. #4 Auto AC (in the top two grades) and the thankfully non-aftermarket looking head unit. It's the same smartplay infotainment system we've seen in other Marutis and experience tells us that this works perfectly well. Why the aforementioned “ thankfully”? These are two things we didn't see in the Indonesian-spec Ertiga. #5 The Audi-esque fake AC vents, flat-bottomed steering wheel, chunky, smooth finish wooden insert reflect more effort put in to make the new car feel special. This dashboard is unique to the Ertiga, unlike the old one that was a drag and drop from the Swift. #6 Cool features: The Ertiga gets segment-first ventilated cupholders (useful for phones with a tendency to heat up too), a new colour MID in the petrol (same as the new Ciaz) and 12V sockets for all three rows. #7 It gets a big boot with all the seats occupied too (209L-550L-803L). The third row's recline adjustment lets you strike a balance between luggage space and passenger comfort. For more space, there are two storage cubbies under the boot floor too. They're deep enough for a toddler's backpack each. #8 Safety basics: Dual front airbags, ABS with EBD, rear parking sensors, ISOFIX, high speed alert, front seatbelt reminders and seatbelts with pre-tensioners and force limiters, all come as standard. The AT grades also get ESP and hill hold. But now it’s time to look at what we don’t like..
#1 Still no ESP for the manual, or six airbag option at all. #2 The feature misses are strange. No auto headlamps or wipers, there's a blank space on the steering where cruise control should've been, there's no reach adjustment for the steering and no auto-up for driver window! Come on! #3 The overall quality is acceptable, but nothing great. Even the Santro's interior plastics feel richer. Experience with the Dzire also makes it clear that the seat fabric will not age well. The interior looks more upmarket, but is very familiar when it comes to other senses. #4 There are still some age-old controls (the power window buttons). And you still get ugly instrument cluster stalks that don't deserve a place in a car that's here six years after the original. The top models of the new Ertiga can easily cross into about Rs 13 lakh or more (on-road) and compromises like these, at that price? Nope, not cool at all. #5 A little nit-picky here, but we would've liked proper tumble-forward middle-row seats or a captain seat option, which would've been nice touches. And that’s largely it. It is a brand new place to be in, but some touches/misses just don’t belong in a car like this in 2018. It’s like moving to a new home in a more upscale locality, but having the same old, loud and nosy neighbour. You get the same 1.3-litre diesel engine as before, still good for 90PS/200Nm and available only with a 5-speed manual gearbox. At 25.47kmpl, it’s about 1kmpl more efficient as per Maruti’s claims. But one big, noticable difference here is a change in the SHVS assist. It feels like Maruti has polished it further. Even though it doesn't have the petrol's lithium ion SHVS setup, the initial torque assist feels more fluid. So when you're throttling out in traffic, for the first second, maybe second and a half, you feel some lag. That's largely because this isn't an engine that's very quick to rev. But once you're past that, the car picks up pace and delivers power smoothly. Then you enter the 2000-4000rpm zone, its mid range, where this engine has always been quite comfortable. So overtakes may need a little planning, but you won't necessarily have to downshift. But in the 1.5-litre petrol, which is borrowed from the new Ciaz, you will need to plan overtakes - downshift and rev it up before you commit to it. Its mid-range performance, even with the output gains of the bigger engine (13PS/8Nm) is rather flat. And as before, it’s available with a 5-speed manual gearbox or a 4-speed torque converter automatic. That said, the slight initial lag of the diesel isn't something you feel in the petrol, because the engine revs up quicker. And like before, you can upshift early, before 2000rpm and enjoy a relaxed drive in most scenarios. The cherry on top is that the petrol versions are now more efficient by 2kmpl (petrol claimed FE MT/AT = 19.34kmpl / 18.69kmpl), while enhancing the drive experience rather than dulling it down. What’s common between these engines is that they give you two benefits. One, city driving is easier since the throttle input can be milder, topped with the super light controls. And two, inclines. Earlier you'd have to overcome the lag to get the torque in the diesel, and the petrol would have to be revved harder to get going because the torque assist and spread wasn't as good, without the SHVS assist. As for our pick for a full passenger load, it's still the diesel. The petrol will do alright at low-to-medium speeds, but even low-speed overtakes will need some effort with a full load. It'll do better now than before, but diesel torque is diesel torque. Good news is that the ride has improved. The new Ertiga doesn't crash through potholes the way the old one did and is quite unfazed by bad patches. Stay at 80kmph, and it rides quite flat for all three rows. But beyond that, you sense an increase in vertical bobbing. That said, there's some amount of side to side movement that's noticeable all the time. While it's fine in the city, it can get annoying for intercity trips. Also, there's noticeable body roll. Even at 60kmph, lane changes shimmy in the cabin. The good bit though, is that it settles quickly, so even when it rolls, it doesn't keep waving about and regains composure quickly. Simply put, the drive experience is better in every aspect. The Ertiga is better to drive, the ride's improved and it's claimed to be more efficient too. The new Ertiga has a new platform, a new look, some new features and even more polished powertrains. And all of this does make it appeal to the heart a lot more. Is it a major upgrade from the old one? More specifically, if you own an Ertiga now, does this feel like something from a segment above? Not really. The experience here isn't tremendously different from the old one. But what Maruti has done is make it more practical - a better people lugger - a little more appealing on the inside and out, and, indeed, an even better family car. At Rs 7.44 lakh to Rs 10.90 lakh (ex-showroom), it is more expensive than before, but still undercuts its main rival, the Mahindra Marazzo significantly, while offering an improved value proposition that we'd say justifies the premium. What Maruti Suzuki is saying with this is, you don't have to fix what isn't broken, but you can always improve it. Pleaseinform 1500cc Disel engineLaunch time of Ertiga vdi zdi. Pleaseinform 1500cc Disel engineLaunch time of Ertiga vdi zdi.